New growth factor synergistic systems. Feature article and cover. ChemComm, Issue 91, 2016. A feature article has been published by Professors Manuel Salmerón-Sánchez and Matthew J. Dalby in the journal ChemComm (Chemical Communications). The paper – Synergistic growth factor microenvironments. Chem. 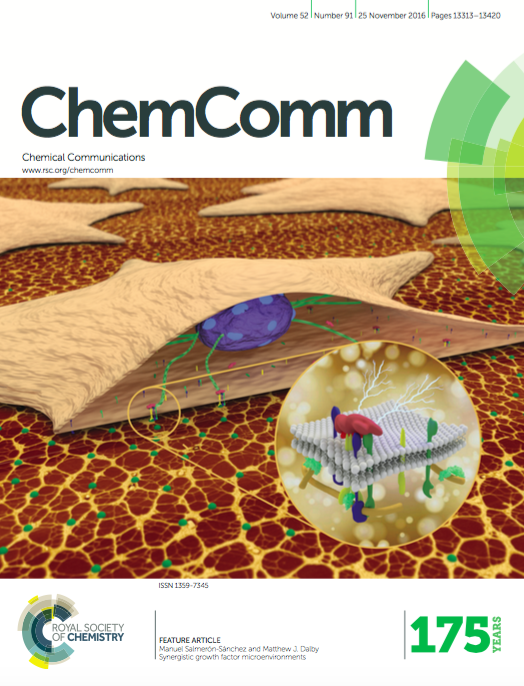 Commun., 2016, 52, 13327-13336 – is also accompanied by a contribution to the cover of ChemComm, Issue 91, 2016, thanks to the art skills of Dr. Aleixandre Rodrigo-Navarro. The paper describes current advances with the presentation of growth factors (GF) bound to surfaces from a solid-phase state rather than in soluble form, recapitulating the way the extracellular matrix (ECM) binds GFs. This more effective presentation allows GFs to work in cooperation with integrins and enhance GF signalling due to the crosstalk between both receptors. This knowledge has been used to engineer microenvironments that target simultaneous integrin and GF receptor engagement seeking to maximise GF effects in vitro (e.g. in terms of stem cell differentiation) but also tissue repair in vivo (e.g. bone regeneration and wound healing).